Travel the world’s barbecue trail and you’ll find a number of constants. Every culture has its version of grilled ground meat, for example, from Middle Eastern kofta to Pakistani chapli kebab to the classic American hamburger. Meat on a stick is another constant, morphing from Peruvian anticuchos to French brochettes to Azeri lula, Indonesian sate, and Turkish shish kebab. Summertime, with its farmers markets and roadside produce stands, gets me thinking about another dish that turns up on every corner of Planet Barbecue: grilled corn. Oaxaca, Mexico, where corn is grilled over a charcoal fire, slathered with mayonnaise (yes, mayonnaise), sprinkled with piquant grated cotija cheese, chili powder, and lime juice. Port of Spain, Trinidad, where grilled corn comes smeared with garlic-culantro butter. Mumbai, India, where they electrify grilled corn with fresh lime juice and cayenne pepper. Bogota, Colombia, where street vendors grill corn over portable charcoal braziers to be brushed with margarine, sprinkled with grating cheese, and served to you on a stick. Hokaido, Japan, where the corn is so supernaturally sweet it requires nothing more than a quick char over a binchotan charcoal fueled hibachi. (Elsewhere, Japanese grill masters baste less sweet varieties with a mixture of melted butter and soy sauce, sprinkling on sesame seeds for crunch. Americans grill corn, too, but we are riven by debate. 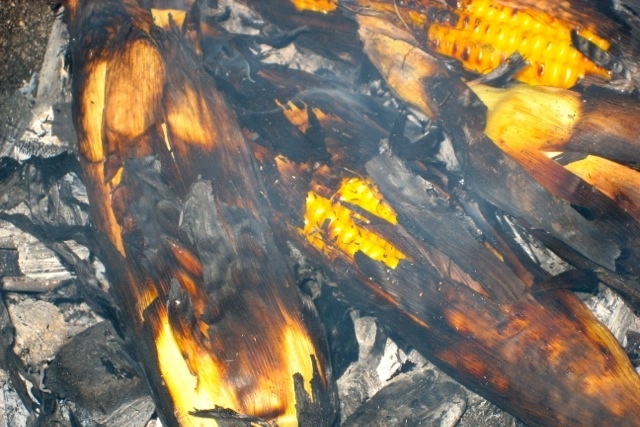 On one side: advocates of grilling corn in the husk, who argue that the husk keeps the corn moist, protecting the delicate kernels from scorching. The other camp insists on grilling the corn naked (with husk off). This caramelizes the sugars in the kernels, producing sweet, smoky caramel flavors. Grilling is all about fire: You won’t get big flavors unless the kernels come in direct contact with the flames. Husk on grilling steams the corn, these partisans argue, which gives you no more extra flavor than boiling. If you’ve watched Primal Grill or Barbecue University, you know where I stand on the debate: I always grill my corn with the husk off. Or more precisely, with husk stripped back (a technique rather like peeling a banana) and tied together below the ear to form a sort of handle. This makes it easy to munch the flame-charred kernels right off the cob. To keep the husk handles from burning, slide a grill shield under them (pictured at top) or a sheet of folded aluminum foil. Actually, there’s an exception to my husk off rule: corn grilled “caveman” style (pictured above). Here you lay the ears, husk, silk and all, directly on the embers and grill until the husk and silk burn off. A splash of butter, a grind of pepper, and a sprinkle of sea salt, and you may be looking at the best corn on the planet. When buying corn for grilling, look for ears that feel heavy with plump sweet kernels. (Strip back a little of the husk back to look.) Corn is sweetest the day it’s picked, which is why I like buying it at farmers markets and farm stands. If the kernels look shrived or dried out, choose another ear or vegetable. Thanks to newer corn varieties like Avalon, Serendipity and the appropriately named How Sweet It Is, most of the corn you buy will be sweet—even if you buy it at the supermarket. In the event it’s not, you can take a page from the Lynchburg Fire Department’s playbook. Yes, that, Lynchburg in Tennessee: home of the Jack Daniels Distillery, not to mention one of the world’s most prestigious barbecue competitions: the Jack Daniels World Championship Invitational. The firefighters dish up grilled corn at the festival as a fundraiser and they soak the ears in salted sugar water prior to grilling. Yes, they grill with husk on—but over a military strength burner, which chars off most of the husk and silk. The result: here, too, some of the sweetest, smokiest corn you’ll ever sink your teeth into. 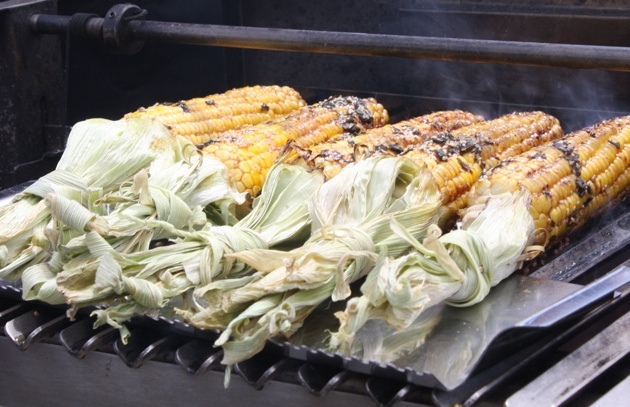 THE NEXT TIME YOU GRILL CORN, FOLLOW THESE DOS AND DON’TS!